A random wire is exactly that—a piece of wire that’s as long as you can possibly make it. One end of the wire attaches to a tree, pole or other support, preferably at a high point. The other end connects to the random-wire connector on a suitable antenna tuner. You apply a little RF and adjust the antenna tuner to achieve the lowest SWR. That’s about all there is to it. Random-wire antennas seem incredibly simple, don’t they? The only catch is that your antenna tuner may not be able to find a match on every band. The shorter the wire, the fewer bands you’ll be able to use. And did you notice that the random wire connects directly to your antenna tuner? That’s right. You’re bringing the radiating portion of the antenna right into the room with you. If you’re running in the neighborhood of 100W, you could find that your surroundings have become rather hot—RF hot, that is! We’re talking about painful “bites” from the metallic portions of your radio, perhaps even a burning sensation when you come in contact with the rig or anything attached to it. 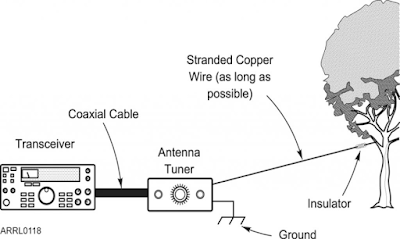 The random wire antenna is probably one of the least expensive, easiest and cheapest HF antennas to use if you have a tuner and you want to get the "most" out of a length of "random" wire without having to pull out that calculator, doing the math, getting the center insulator built or bought, running the feedline, and all the rest that goes with putting up a more elaborate antenna. 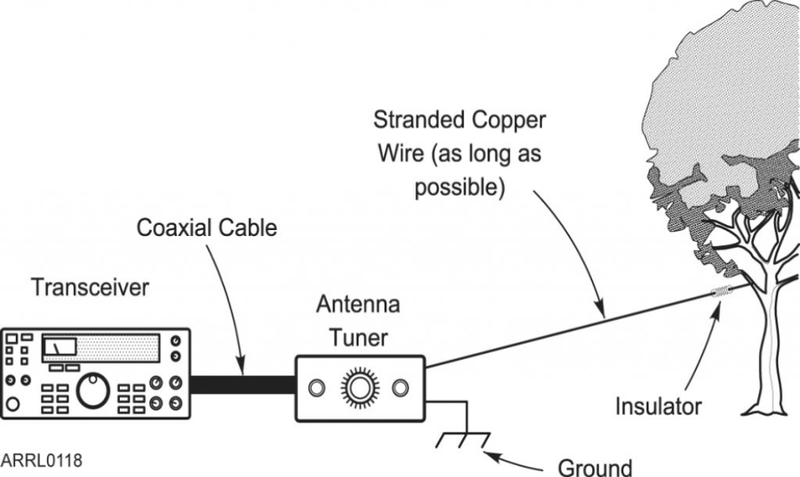 All you need for a random wire antenna is some wire, your tuner, one or more supports up as high as you can get them to string the wire from the supports to the tuner, at least one or two insulators and a little time. One single wire, no solder connections, very simple… all the way from the tuner to the end support. That's it in a nutshell… or is it? Many hams have tried till they are blue in the face to install the random wire antenna that works on most; if not all of the HF bands with terrible results. SWR usually is all over the place and the tuner will just not do it's job. You can get good loading and low SWR on sometimes 2 or 3 bands, but one or more of the bands that you want, just will not cooperate with an SWR that can be adjusted with the "tuner". So after much frustration, down it comes and you go on to a totally different type of antenna… all that time just wasted in your opinion… until now! We recently found some good information about random wire lengths that you should and should not use. Jack, VE3EED, hopefully has solved a major headache we all have when we attempt to go thru the trial and error and frustration with getting the random wire to work where WE want it to work. He knew that in order for the tuner to "see" a fairly low SWR to work within it's range, that the antenna had to be NOT A HALF WAVE ON ANY FREQUENCY that we wanted to use, because a half wave will give us a very high impedance and the resulting high SWR into a 50 ohm transmitter! So Jack took most of one day, did the math with the aid of his trusty calculator, several cups of coffee and came up with, in Jack's own words… "Here's the word on random-wire antennae." 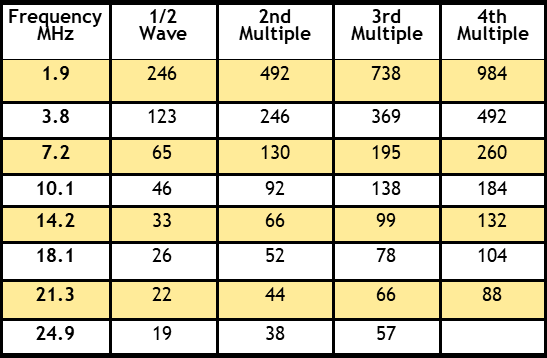 Presented for your consideration by Jack, VE3EED, the table (next page) represents half wave lengths and multiples that you DO NOT WANT TO USE! These lengths in the table are the culprits that cause all of the trouble when using random lengths. So those are the numbers above that we have to stay as far away from as possible when building a long-wire antenna. Here they are in order: 16 19 22 26 32 33 38 44 46 48 52 64 65 66 76 78 80 88 92 95 96 99 104 110 112 114 123 128 130 132 133 138 144 152 154 156 160 165 171 176 182 184 190 192 195 198 208 209 220 224 228 230 231 234 240 242 246 247 256 260 264 266 272 276 285 286 288 297 304 308 312 320 322 323 325 330 336 338 342 352 361 363 364 366 368 369 374 380 384 390 396 399 400 414 416 418 429 432 437 440 442 448 455 456 460 462 464 468 475 480 484 494 495 496. REVISION NOTE: James, KB5YN, points out that one of the so-called GOOD numbers was 220 feet. That is the 10th multiple of a half wave on 15 meters. His radio didn't tune up very well on 15 meters. So, having nothing better to do one day, I re-did the calculations going out to 500 feet. That meant calculating all the way to 32 multiples of a half wave on 10 meters. I won't bore you with all that so the first portion of this still only shows up to the 4th multiple. There are so many new frequencies to stay away from, that it gets pretty tricky for the longer wires. However, the list has been revised and is good for wires as long as 500 feet. 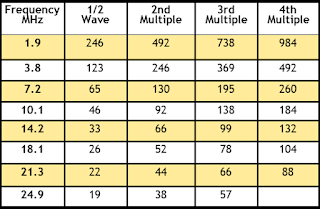 He plotted the results for the U.S. CW band edges for use with his 4 band Elecraft K1 QRP rig. You will note that when comparing Mike’s results with VE3EED that some of the results are a bit different.